Union Home Minister P Chidambaram today said his ministry had proposed three amendments to the Armed Forces Special Power Act (AFSPA) and those were under the consideration of the Cabinet Committee on Security (CCS). 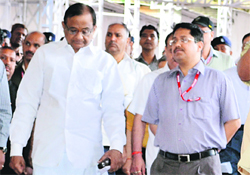 Chidambaram was on a day-long visit to the state to review its security situation. Rumblings within the Punjab Congress have reached a crescendo with the group opposed to the state party chief deciding to approach Sonia Gandhi with a one-point agenda: replace Amarinder Singh. Army Chief General VK Singh has formally written to the Central Bureau of Investigation (CBI) about the bribe offered to him for allegedly clearing the purchase of all-terrain vehicles for the armed forces. In a big relief for Gujarat Chief Minister Narendra Modi, the Supreme Court-appointed SIT has given him a clean chit in the post-Godhra Gulberg massacre case and sought its closure as it found no evidence against him. The country�s largest telecom operator Bharti Airtel launched India�s first 4G service in Kolkata today. Airtel�s 4G (TD-LTE) network was launched by Minister of Communications and Information Technology Kapil Sibal. Indian-Americans, Bobby Jindal and Nikky Haley, are emerging as possible vice-presidential running mate of Mitt Romney, who is expected to bag the Republican Party�s nomination for presidential polls. For young NRI Navneet Singh, it was the longest night on Monday. A group of half-a-dozen kidnappers took the Canada-based NRI to a nondescript Kurukshetra village. The kidnappers then called up his brother in Canada and demanded a ransom of Rs 1 crore.